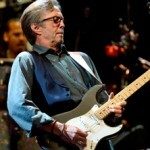 Eric Clapton has announced two upcoming dates. Clapton will play in Glasgow on the 21st June and in Leeds the following night on the 22nd June. Tickets for the gigs will go on sale on 31st January at 9AM (pre-sale 29 January).